Dr. Jeff Werber is an Emmy Award-winning, nationally renowned veterinarian and former president of the Association of Veterinary Communicators. He also serves on the advisory boards of Veterinary Economics magazine and Last Chance for Animals, and recently completed his term as a member of the Legislative Committee of the California Veterinary Medical Association. Werber earned his undergraduate degree in Zoology from University of California-Berkeley in 1976 and his Veterinary degree at the University of California-Davis in 1984. He owns the prestigious AAHA-accredited Century Veterinary Group in Los Angeles, a Veterinary Economics Merit Design Award-winning hospital. He resides in Los Angeles with his family and his 11 pets (5 dogs and 6 cats). 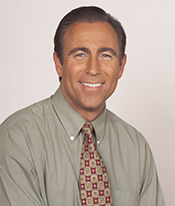 Werber began his media career in 1987 as a segment contributor on Hour Magazine, then became the resident veterinarian for ABC’s "Home Show" for five years. In 1996 he hosted his own show, "Petcetera," on Discovery’s Animal Planet Channel for which he was nominated for a Cable ACE Award, and last year served as the host of "Lassie’s Pet Vet," which aired nationally on PBS. In September of 1997, Werber became the pet expert for CBS News in Los Angeles, where he was awarded an Emmy for his pet health reporting. During this time he was also the veterinary correspondent for The Early Show on CBS and a contributor to two other shows, Great Day America and The Parenting Table. He has appeared a number of times on "The Rachael Ray Show," and is currently a veterinary expert to "The Dr. Oz Show," CNN, and E! Entertainment, most recently on "Insanely Pampered Hollywood Pets," "Pit Boss" and "House Husbands of Hollywood." He also hosts "Let’s Talk Pets" with Dr. Jeff, a weekly call-in radio show on KABC Talk Radio in Los Angeles. In 2001, Werber launched his own premium pet product line, jeffwerberpets, which was highlighted as a “Best New Product” in Instyle magazine, and is featured in many pet boutiques and pet stores across the country. He also consults to, and is the veterinary authority for, United Pet Group’s Pro-Sense pet product lines. Werber is a frequent lecturer at many of the nation’s top veterinary conferences, and is a contributor for Veterinary Economics magazine. In his spare time he’s also a spokesperson for a few national pharmaceutical companies, and is a host and segment writer for the Pet Care Television Network.